Another shot has been fired in the long-running Sriracha Wars, this time with Huy Fong Foods filing a countersuit against the city of Irwindale, alleging harassment. 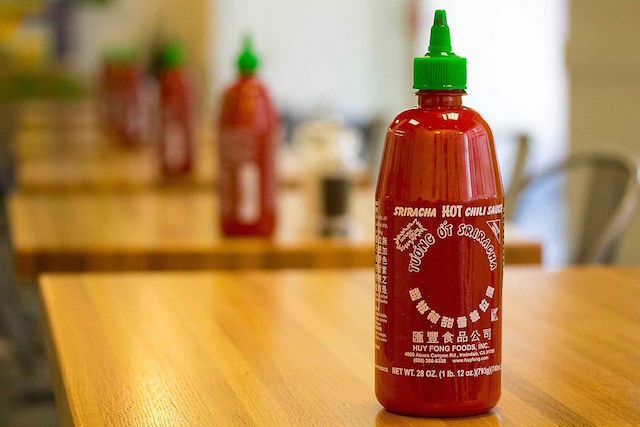 In case you don&apos;t remember, the Sriracha Wars began way back in 2013, when Irwindale, a small industrial city east of downtown, first sued the makers of your favorite hot sauce over complaints that odors from the factory were creating a "public nuisance." Hot sauce connoisseurs across the globe panicked at a possible Sriracha shortage, while burning chilli fumes stung the eyes and throats of Irwindale residents. The matter was thankfully resolved by early 2014, but issues between the two factions resurfaced in May, when Irwindale filed another lawsuit against Huy Fong alleging that the company owed them a bunch of money in unpaid fees. Now, in what has basically become the Hatfield-McCoys of the near San Gabriel Valley, the condiment company has countersued, this time alleging that Irwindale has engaged in a "campaign of harassment" against them. Huy Fong Foods, which is named after the Taiwanese freighter that brought its founder to America when he fled from communist Vietnam in the late 1970s, moved their operations from Rosemead to Irwindale in 2009. The company initially signed a deal with Irwindale where they agreed to make 10 payments of $250,000 over 10 years, in lieu of paying taxes to the city. All went according to plan until 2015, when the condiment company decided they would no longer be making payments because they had been "treated unfairly" by the city. Irwindale City Attorney Fred Galante told LAist back in May that the city had tried to obtain payment "countless" times before they decided to take legal action action against the company. All caught up now? Oh wait, we forgot to mention that Irwindale is also home to the Renaissance Pleasure Faire of Southern California, which isn&apos;t particularly relevant but we like to keep our readers informed nonetheless. Okay, onward. In their countersuit, which was filed in Los Angeles Superior Court on Tuesday, Huy Fong is asking for a judge to either declare the fees invalid, or possibly take other actions, including, they hope, finding that Huy Fong is entitled to a recovery of the $750,000 in previous contributions. According to the lawsuit, Huy Fong alleges that they have been very supportive of Irwindale over the years, including making an effort to hire local residents and giving away an estimated $100,000 worth of free t-shirts, Sriracha sauce and Sriracha-inspired snacks to locals and visitors. Huy Fong also says that their factory, which is open to the public for tours, has become a "popular tourist destination," bringing visitors and revenue to the city. Huy Fong also claims that their yearly contributions had previously been voluntary, and that the city had reclassified them as mandatory without their permission. "The City’s lawsuit improperly seeks to collect from Huy Fong monies not paid by any other business in the City of Irwindale," Jason C. Lo, a lawyer representing Huy Fong Foods, told LAist in a statement. We were unable to reach the city of Irwindale for comment, because Irwindale City Hall is closed on Fridays, which is certainly one way to run a city (and very East Coast of them! Looking at you, Condé Nast employees who made a dash to the Hamptons as soon as the clock struck noon). In lieu of official comment and in search of a little local color, we called Tako-licious, a small restaurant located directly across the street from the Sriracha plant, to see how the neighbors were feeling. "I can&apos;t talk, we&apos;re busy," Jose, who answered the phone at Tako-licious, first told LAist. "Oh, Huy Fong? We&apos;re completely fine with the Huy Fong Foods people," Jose then said. We will keep you posted regarding any updates in this important story as they develop. In the meantime, feel free to send us some Sriracha-flavored snacks.